Nomsa confirmed to have XDR-TB and a woman goes in to labor at TB Hospital. This blog has two stories. One is about Nomsa’s health status at the TB Hospital. The other is about a pregnant woman, also at the TB Hospital. I will give more detail about the pregnant woman in this blog and then give a detailed report about Nomsa on my Wednesday blog (wednesdayswithnomsa.blogspot.com). Thursday night Nomsa sent me a text message telling me that she had run away from the hospital after a nurse (who should be fired) left her a note on her bed giving her the “heads up” that her most recent SMEAR test had come back positive and she would be moved in to isolation the next day. Nomsa ran and then asked me to forgive her. It was a long complicated night, but with help from friends who shall remain anonymous we were able to find her in Manzini, get her back to the TB Hospital and sneak her back in to the ward with the promise that I would come in the morning and discuss it all with her. The morning came and Chloe and I headed to the hospital. When we arrived we learned that the Doctors were going to meet with Nomsa and tell her that she was no longer responding to the Multi-Drug Resistant Tuberculosis (MDR-TB) and that they now wanted to start treating her for Extremely Drug Resistant Tuberculosis (XDR-TB) and they would immediately move her into an isolation room with one other patient so that she did not infect any of the MDR-TB patients with XDR-TB. There is a documentary being filmed about MDR-TB and so the filmmakers were there to capture this awful moment (their intention is to bring awareness to the issue and hopefully drug companies can help with better treatments in third world countries). The message of XDR-TB is equal to being given a death sentence, and Nomsa knew it. She is a smart girl and asks questions so she knows that no one has recovered from XDR-TB in Swaziland, ever. The news was devastating, the silence was earth shaking and her tears were heart wrenching. Nomsa is being told she has XDR-TB. BBC/PBS filming. On the other side of the half wall lay another MDR-TB patient who was pregnant. She is bone thin with a small baby bump showing the world that she was carrying a child. She is also HIV positive and very very weak. Her CD4 count (for those who know that is) is between 129-230. After delivering Nomsa’s news the Doctor moved on to finish her rounds in the ward. She found the woman in distress and suspected that she was in full labor. The baby was only 34 weeks old, but an emergency C-Section would need to be done to save both mother and child. There is no labor and delivery facility at that hospital so other plans had to be made and made quickly. Thankfully the woman was in false labor just one week ago and that prompted me to try to help find a hospital that would admit and care for an MDR-TB patient. The disease is highly infectious so it would require full isolation as well as total fumigation of the Operating Room with no use of it for 24-hours. The C-Section would have to be perfectly timed on a Friday afternoon after all other C-Sections are completed and the room can rest for the weekend. I am thankful to say that the private Women and Children’s Hospital (WCH), where Benjamin was treated for his burn and where Helen Muli had her baby last Friday, said “yes” and agreed to help us. Unfortunately the OBGYN at the WCH died suddenly and unexpectedly a few short weeks ago and the Doctor who was filling in for her lost her brother suddenly last Friday so there was a “hole” in the communication process when we tried to contact WCH. I will say that Sister Patience (who likely will never read this blog) was amazing and stepped right in to help bring order to confusion and prepare for this special patient. Then there was the transportation problem. The TB Hospital did not have a way to transport the woman in labor to WCH. WCH had an ambulance, but it was heading to Mbabane (the opposite direction). The labor pains were intensifying and the woman was 4cm dilated. Sister Patience asked if I had a car and could just bring her. Well, yes, I guess, but she is in labor and has MDR-TB … but what was the alternative? Chloe and I went back to the hospital and helped her out of bed. Took her hospital gown off and put clothes on her rake thin body. Helped her down the stairs. Put a mask on her (we already had masks on) went back and got a blanket for her along with her cell phone and the nurses handed me her MDR-TB medications (syringes for her daily injections and 22 pills per day) along with her HIV Anti-Retroviral tablets. Surreal. MDR-TB patient in labor in our car. As I was driving away with windows open for natural ventilation and CDC masks on I suddenly wondered about liability? Patient confidentiality? Family input and a thousand other things. Last week when we formulated the plan for us to take her to a private hospital I did speak with the woman’s brother to get his consent. He was so happy that we wanted to help and asked if we could also take the baby when it was born as he was already caring for three of her children? I said we would discuss that after the baby arrived with Social Welfare involved. So as Chloe and I drove the woman and her labor pains were intensifying I thought it best to call her brother again. Thankfully he was still happy that we were helping and gave his consent. In fact, only an hour later he also gave the nurses consent to do a tubal ligation during surgery to prevent any further pregnancies for this woman. 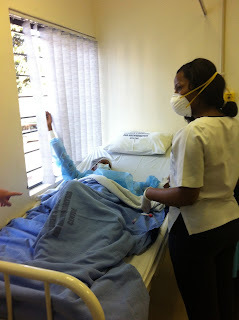 MDR-TB patient in isolation at private hospital. At 4:55PM a beautiful little baby girl was born. I was thankful to be in the Operating Room for the surgery, but it was eerie to see a beautiful life come out of something that looked like a corpse. I don’t mean to be unkind or critical, but that is what it looked like. Even Sister Patience commented on how such a perfect new life could come from “that shell”. The baby was 2KG (4.8 lbs), breathing on her own and looks perfect. Welcome baby girl (unnamed). 2KG and healthy. I requested that the baby not be taken to the mother for two reasons. First, the baby must not be exposed to MDR-TB if possible. Second, the mother is HIV positive so if we can avoid breastfeeding that would be best. But the real question is if the mother will take the baby home or if she will come to us. If the baby goes home with her (well, with the family because the mother will go back to the TB Hospital) then they can decide how the baby is fed. If she comes to the El Roi Baby Home then she will enjoy a formula diet. As Chloe and I drove home at 6PM I received a call from an unknown number. It was the Grandmother to the new baby girl. I had texted the good news to the brother and he had called her. She was so happy to hear that both mother and baby were well (technically we aren’t sure about mother yet, but the surgery went well). She requested a meeting with me today at noon at the hospital. I am hoping that we will meet and that she will take the baby girl home to be raised within the family, but I suspect that will not be the case. I will post an update on this blog after the meeting. God’s timing is always perfect. If Nomsa had not run away on Thursday night I would not have been at the hospital to hear the news with her about her XDR-TB status. If I had not been there I may not have been notified that the woman was in labor. The Lord had Nomsa there for a specific purpose in that woman and baby’s lives and HE kept her there until His work was complete. I stand in awe of an awesome God who sees everything and wastes nothing. Live from Swaziland … I will start to write my Wednesday blog now. It is heart breaking and complicated. Update: On Saturday I went to the hospital and met with the woman who I was told was the Gogo (Grandmother). In fact, she wasn't the Gogo, she was the wife of the oldest brother of the mother of the baby. Why wasn't the Gogo there? Because she was drunk. According to the family this happens by 9AM each morning so by the time we met at noon there was no speaking to her. The mother of the baby named the baby "Surprise" because she said she didn't know she was pregnant until 6 weeks ago in the hospital. Well, "Surprise" is now at the El Roi Baby home and while we will always have her given name as a part of her life, we will nickname her Abigail. We are thankful. One baby to hospital, one baby’s legs amputated, one unborn baby at high risk. This was a tough week. Within the past 24 hours we correctly diagnosed a 9-month old baby in the rural community who was severely malnourished with Kwashiorkor and got her and her mother to the hospital days before she would have died (according to the doctors). 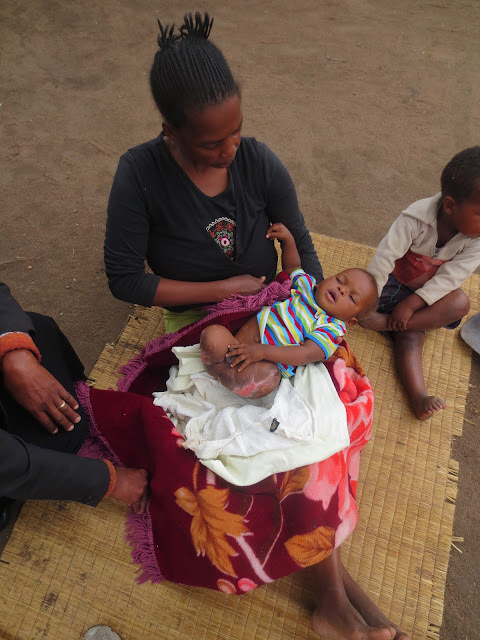 Last year this same mother lost a child to malnutrition after spending SIX WEEKS in the hospital. They had arrived to late. Next we met another 9-month old baby who “somehow” was found in the middle of a cooking fire and whose legs were burned so badly that they had to be amputated. The baby had been discharged on April 16th and still had large 3rd degree burns exposed. They had been told to keep the wound open so that it would heal. Based on my learning from Benjamin’s burns I knew that the skin would never grow back and he would need skin grafts. In addition the wounds were infected and they had no antibiotics or even bandages. We were able to get him to the hospital and directly to a surgeon who cleaned up the wounds, treated with antibiotics and scheduled a meeting in two weeks to discuss skin grafting. Total cost to help that day was $6 USD. But neither of those situations were what really sucker punched me. It was the 9-month* pregnant woman who is dying of Multi-Drug Resistant Tuberclosis in the hospital and was believed to be in labor. When I dropped in to see Nomsa on Wednesday she told me about this woman’s tragic situation and we tried to speak with the woman to encourage her, but she is totally deaf now from the TB treatment. She is bone thin from extreme weight loss and her eyes were sunken back in her head. She would slowly reach out her hand to ask for help, and would shout out as she couldn’t hear the volume of her own slurred words. After praying with her we left and went on our way. The next day I stopped in to see how she was doing on a “nudge”, only to find that Nomsa was convinced the woman was in labor. She had a urinary tract infection, which I am told can bring on labor. An ultrasound suggested that she was 36 weeks pregnant, but to the naked eye looks like she is 6-months pregnant and hardly showing. This is a long, long story that I will cut short for Saturday morning purposes. After voicing my concern to other patients and our volunteers (not helpful) I went to the nurses and asked specific questions about how and where the woman would give birth. The nurses told me that she can’t give birth naturally because childbirth would like be the death of the mother, and possibly unborn child. She would need a Cesarean Section. I asked where that would be performed (believing she was in labor at that moment) and the nurse said she did not know. No plans had been confirmed at that time, but she did know of several local hospitals who had explicitly said that they would not allow the woman to enter the hospital for fear that she would spread the horrific disease that she was living/dying with. MDR-TB is highly infectious and highly deadly, especially for people who are HIV positive and whose immunity is already compromised. With an estimated 46% HIV rate in the country some hospitals have chosen to not have any MDR-TB patients admitted to their hospitals. But then what? Where would she go? The nurse didn’t know and were clearly uncomfortable that I was asking (pushing). They assured me that when the time come that the doctors would have a plan, but I suggested that the time might come at 2AM and with no plan in place now, both mother and child would die. I am not putting thoughts in their minds, but I wonder if they were thinking that might be the best option for both mother and child? The mother is likely to die from this terrible disease and if the baby lived it would be pawned off to an unhappy family member who is already looking after her other three children. They would have one less patient in misery and the world has one less orphan? Well, I don’t think that way, but they were clearly stuck. Finding a hospital to take this woman to was way above their pay grade, responsibility and skill set so they were stuck. I pulled out my phone and called an OBGYN at the Women and Children’s Hospital who had cared so wonderfully for Benjamin and his burn care as well as the inducement of Baby Daniel’s mother. They are arguably the best (or in the top two) private hospitals in the country. I explained the whole situation and she after I had finished there was a long pause, and then she said, “WOW!”. Yes, wow. What do we do? I am not going to lie, knowing that the doctor I called was pregnant (and was also Helen Muli’s OBGYN) was part of my hope that she would have extra compassion. After more pause she said that she would go and speak with the Chief Medical Officer and call me back. And she did. Only 20 minutes later she called and said they would do it! (!!). There were criteria that we would need to work with because they would need to fumigate the surgical room and let it sit for 24-hours after the surgery before it could be used again (i.e. over the weekend) and then they would provide her with an isolation room for three days before she was transferred back to the TB hospital. I really couldn't’ believe my ears. The next day I called the Chief Medical Officer at the TB Hospital and gently introduced myself and tried to explain the situation without suggesting that they did not have the situation totally in control, but I did say that IF we could help and IF our help was needed that we were willing and able. Note here that I did not have funding for this (likely $2,500+ USD), but I believed that if this was what the Lord wanted then He would provide the funds. The Doctor thanked me for my call and said he would look into the situation. By the end of the day he called back and said that he had personally gone to examine the patient and they believed that she was not in active labor. He assured me that they did have a care plan in place, but they believed that our offer was a much better solution and would provide a better chance of both the mother and the baby living. He thanked me again for stepping out and taking the risk of helping and that he would like me to connect him to the people at WCH to make a plan. Within an hour of that call the hospitals had spoken, and OBGYN was assigned to go to the TB Hospital to examine the patient and a plan would be made for delivery. I want to mention here that I/we in no way were doing this or involved in order to receive her baby at El Roi. That never entered my mind because I believed (or chose to believe) that she had family that was ready to take the baby. When we contacted her brother to get consent to move her to a different hospital for child birth he thanked us, fully consented and then asked if there was some way we could keep the child? It was then that he told us he was caring for her first three children. We will cross that bridge when we get there, but for now I believe that this young woman has a chance at life, and so does her unborn, innocent child. I woke up this morning at 3AM and had a message from a dear friend in the US. She asked what the cost of the C-section and hospital stay would cost? I told her I was guessing $2,500. She has offered to pay the hospital bill. El Roi sees us all. He is our provider and our protector. I am so thankful that Nomsa is a patient at the TB Hospital because God is using her in a MIGHTY way. It is not a place I would want to live, and nor does she, but she does see that HE is using her and she has days were she is less hopeless because of that knowledge. 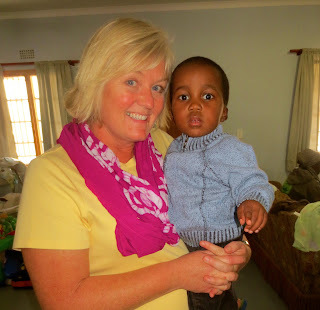 Live from Swaziland … I love when educated and powerful people work together to help others. 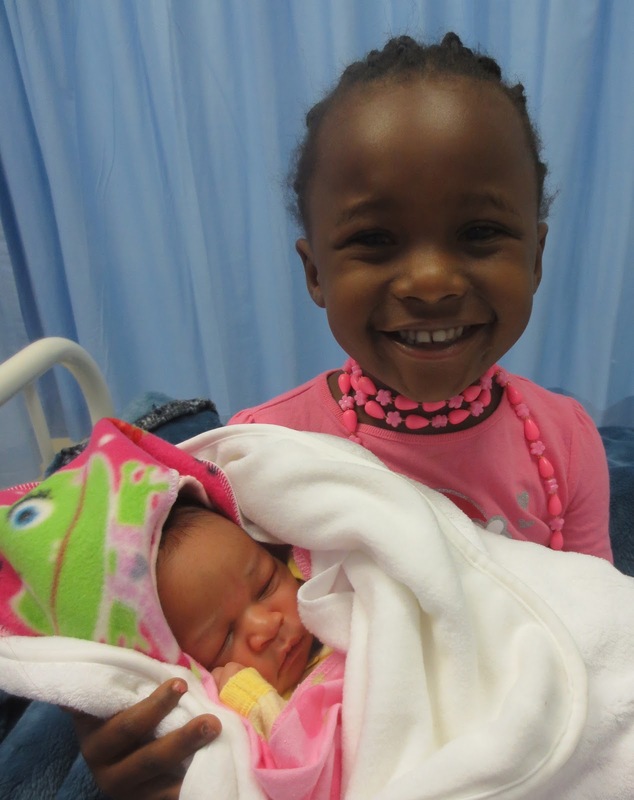 PS – on a very happy note I am thrilled to tell you that Helen and Peter Muli have a brand new baby girl! Her name is Rosylen Muthikwa and she weighed 3.5 KG. Mother and baby are doing well. Her OBGYN missed out on the delivery due to the unexpected death of her brother, but she made the TB/C-section situation happen before she left for home. Thankful. *I do find it a strange coincidence that all three stories above with “9-months” old including the pregnancy. Measles, Mumps, Chicken Pox and AIDS - childhood diseases. Do you take children’s vaccines for granted? I do, or at least I used to. I realize that some of you are opposed to childhood inoculations for various reasons, but for the writing of this blog I will presume that the majority of people in the Western world to subscribe to childhood vaccinations. That being said, here is my encounter with Measles, Mumps, Chicken Pox and AIDS in the past couple of weeks. Measles. We have had an outbreak of measles in Swaziland and everyone in the nation has been called to get immunized. Thankfully, I thought, all of our children have already been vaccinated for measles, but with the current outbreak our Doctor suggested that all the children (of the right age) get a Measles vaccination again. Why? Our Doctor said, “Vaccinations given at local clinics haven’t always been stored at the correct temperature and therefore may not been effective.” That was not comforting to any of us, but Brooke (our wonderful volunteer Nurse Practioner) went and got the Measles vaccine and vaccinated all our babies, again. Mumps. Last week I picked up the mother of Baby Daniel so that we could go and have a meeting at the Social Welfare office. She told me that her 5-year old had a fever and her throat was getting larger. She asked if we could go to the hospital, so we did. Sure enough, she has Mumps. I called Brooke to ask if the MMR (Measles, Mumps and Rubella) was given to our children (thinking that we may have an outbreak of Mumps coming). Brooke said no, they don’t vaccinate for Mumps or Rubella here, just Measles (maybe or maybe not stored at the right temperature). Chicken Pox. It started with a couple of spots on a child at the Farm Managers Building. That wouldn’t have been a big deal except that the child’s mother works at the El Roi Baby Home AND she has never had Chicken Pox before. As we discussed the health protocol with Brooke and the team we found out that many/most of the Aunties who work at El Roi have not had Chicken Pox. We had the mother of the child stay home for a week and kept her away from anyone who might be going to the baby home. A week later other children who had been playing with the infected boy showed some blisters and their mother (who also had never had Chicken Pox) also was kept away from work. Then we discovered that two of our Aunties are pregnant and neither of them had had Chicken Pox before. We had to immediately remove them from the home for 14 days, which left us with several key staff absent for a couple of weeks. Their health and the health of their unborn babies is critical to us so everyone pitched in and helped with the hours. I thought everyone in the world had Chicken Pox? I even hosted a Chicken Pox Party back in Canada when Spencer and Chloe were young when the first sighting of Chicken Pox blisters appeared on our street. The neighborhood parents agreed that we might as well all have it at once so we had a party for all the neighborhood kids, had lots of shared food and drinks to be sure that everyone contracted the inevitable childhood illness and got over it in short order. It worked. Within days all of our children were kept home from school and had spots all over their bodies (some worse than others). When you have 35 children under the age of two years and you have trained care givers who have not had Chicken Pox the last thing you want to do is have a Chicken Pox Party to insure that everyone gets infected. In fact, learning that there is a Chicken Pox vaccine was very exciting and we were given the funds to inoculate the home (big and small) for Chicken Pox, Hepatitis A and Rotavirus. Brooke got me a quote on purchasing Chicken Pox vaccine for all age appropriate babies AND our Aunties and the very morning I approved the purchase Caleb started to scratch. NO! IT WAS TOO LATE! As it turns out, there is no Chicken Pox vaccine even available in Swaziland because of a big outbreak in South Africa so we can’t purchase it until later in 2014. Sheesh. AIDS. 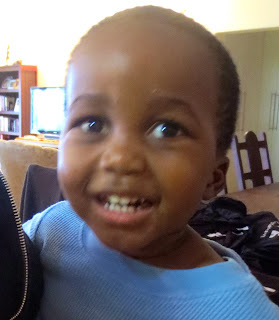 Caleb is one of our HIV positive children and is on second line Anti-retro Viral treatment. We have to keep a special watch on those kids because they are immune suppressed and can get very sick very quickly. Side effects for him could include meningitis, pneumonia and several other things that could prove deadly in his condition. We quickly moved him up in to quarantine (Chez Maxwell) where he enjoyed fresh strawberry pavlova, scrambled eggs with cheese and fruit yoghurt on demand. There is no question that this little boy enjoyed being an only child for nine days and settled in quite nicely to the Maxwell routine. Okay, who’s kidding who? That boy was SPOILED! We are in awe that there has been no further outbreak of Chicken Pox at El Roi and that all is now calm on the western front. Measles shots are complete. My friends child is in her hut for 5-days until she is no longer infectious and everyone is back to work tomorrow at the baby home. When starting the El Roi Baby Home I didn’t even think of things like Chicken Pox and never considered the implications of simple childhood diseases on an HIV positive child. This has been a steep learning curve, and it doesn't seem to ever level out. I am not complaining, I just feel like I should get my PhD in a few more years of life at Project Canaan. Live from Swaziland … I am healthy and happy (and spot free). Babies, children having babies, children caring for babies and another baby.